True Value is two years into its strategic growth plan, and the company is realizing positive results. 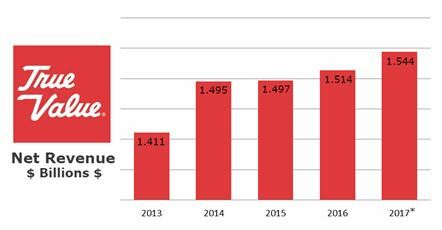 In 2016, True Value grew revenue by $16.9 million (1.1%) while comparable store sales were +2.5% across all member stores and +3.7% at new-look Destination True Value stores. Like True Value, itself, Chain Store Guide is growing its numbers. We’ve recently reviewed our personnel data and added approximately 20 new True Value buyers to our Home Center Operators & Hardware Chains database. 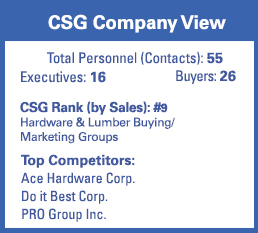 Source: Chain Store Guide Database of Home Center Operators & Hardware Chains. *CSG projection based on proprietary analysis and company statements. Actual figures are subject to change. This data is not intended for investment decisions.